You need to control room pressure in a number of applications. There are many places and instance that are critical and responsive to change in room pressure. For such cases, Vacker KSA has a wide range of room pressure monitoring systems in offer so that you can continuous check and monitor pressure in cities like Dammam, Riyadh, Al Khobar, Jeddah, etc. These monitoring can be either absolute pressure monitoring or relative pressure monitoring. A particular value needs to be maintained in case of absolute pressure monitoring while in the relative pressure monitoring we need to maintain relative pressure difference. Relative pressure value can be either positive or negative pertaining to pressure outside the room. 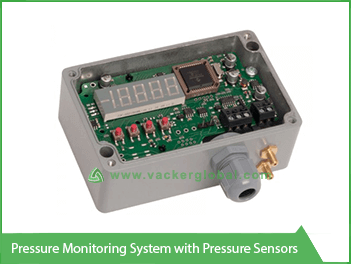 All the pressure monitoring systems measure the pressure of the air. There is a small opening, open to the air, in the devices for the purpose of measuring air pressure. Within the opening is a small membrane that acts as a part of the pressure sensor. These pressure sensors measure air pressure. A single such pressure sensing diaphragm is required in case of measuring absolute pressure. 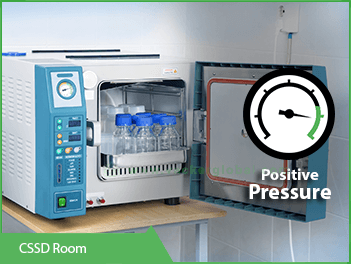 However, in the case of relative pressure monitoring, a system with two sensors is required because you need to measure positive or negative values for pressures in connection to the pressure outside the room. This implies that the sensors need to monitor pressure both inside and outside the room. 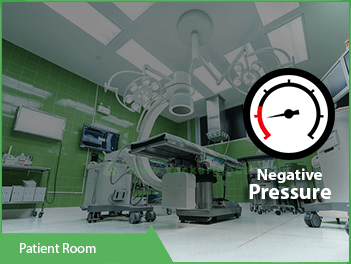 We can consider an isolated ward of a hospital as a negative pressure room. The pressure of these rooms is comparatively lower than the outside area. The bacteria and other foreign bodies cannot go outside the room but the tendency of outside air to penetrate inside is high. The contaminated air has no passage to go outside the room. The sensor shows the difference of pressure between the rooms and generates an alert in case the pressure difference reduces. The alerts can be connected to different alert systems like SMS alert, phone calls and siren with a flashlight. Central Sterile Supply Department can be taken as an example of positive pressure room. These rooms are the places where sterile items are stored in the hospitals and should be kept sterile. Contaminated air from outside should not enter these positive pressure rooms as the sterility of the items can be lost. If the pressure of the positive pressure room becomes equal to the outside surrounding then the alarm starts alerting the user through SMS, phone call and flashlight siren. You can connect your room pressure monitoring system to a centralized recording system. This device makes recording pressure separately possible. This device can store all the data and store it in a centralized cloud-based server which makes it possible to regulate many rooms with the use of a single device. Modbus, BACnet are the various means that connect the pressure sensors to automation system by doing a little modification as required by the sensor. 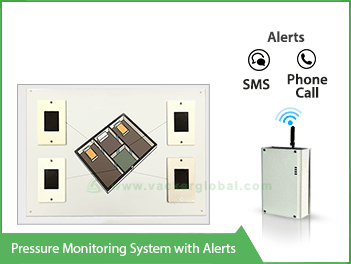 This system that Vacker KSA has in offer come with audiovisual alerts available on the control panel. The user will get a beep as an alert and the screen will start blinking red. A SIM card can be inserted in the device so that a phone call based alert system can be activated and used. This device can generate calls to 4 different contacts in case the level of pressure exceeds the set level. Apart from call alert system, this device also has the provision of sending SMS as a matter of alert. Our latest devices can deliver customized voice messages too. In case the pressure level exceeds the set point then the system will call one contact after another until anyone of them answers the call. However, all 4 of them will receive SMS simultaneously.